You’re going to be mad at me when I say this…but the first time I went to the Greek Deli, I wasn’t a fan. But my office neighbor said that I had to go back and try it again, so I agreed. 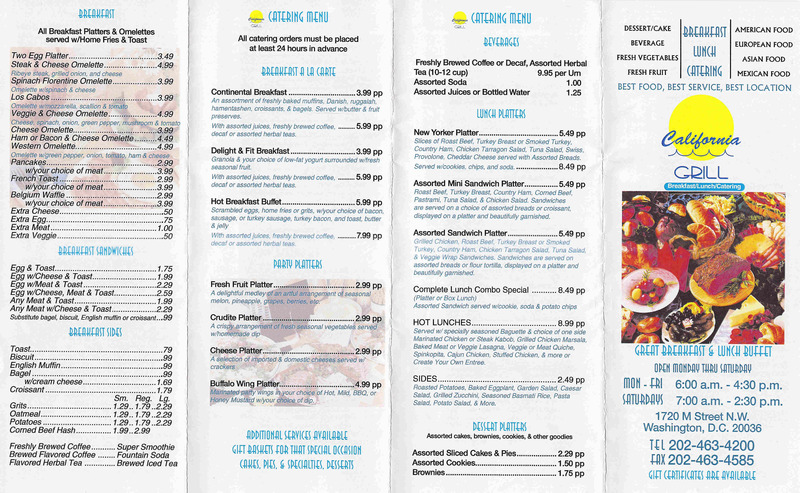 Their menu can be downloaded here. Food: Before I tell you what I ordered, I want to tell you what my office neighbor ordered because it looked SO good (and she said it really was). She ordered the meatballs in this cream-like sauce. The meatballs were the size of baseballs (alright, a little smaller but not much smaller!). I went on the safe side and ordered the chicken gyro. First, the bad. The chicken was dry. But there was enough feta cheese that made it juicy but the cheese was very thick so there was no dripping. There was an abundance of dill and that added a great flavor to the gyro that most Greek places don’t add. This was one of the better chicken gyros I’ve had in DC. Service:The line, when you go at 12 noon (or anytime after), is out the door and a quarter of a mile. It’s crazy. But what I love is you can tell they know and remember their regulars. The chef, Kostas Fostieris, is always at the front and is the one who assembles your meals. Atmosphere: With Greek food items on either side of the line, the restaurant isn’t very big. You order and pay with the cashier. To try to help speed up the line, once you’ve paid and ordered, move to the left. You can eat outside, but there’s not a lot of tables so most people just grab and go. Overall: I’ll definitely go back and branch out to other items. But seriously, I’ll only go before 12 noon so I miss the line. Right across from City Place Cafe is Sunrise Cafe. 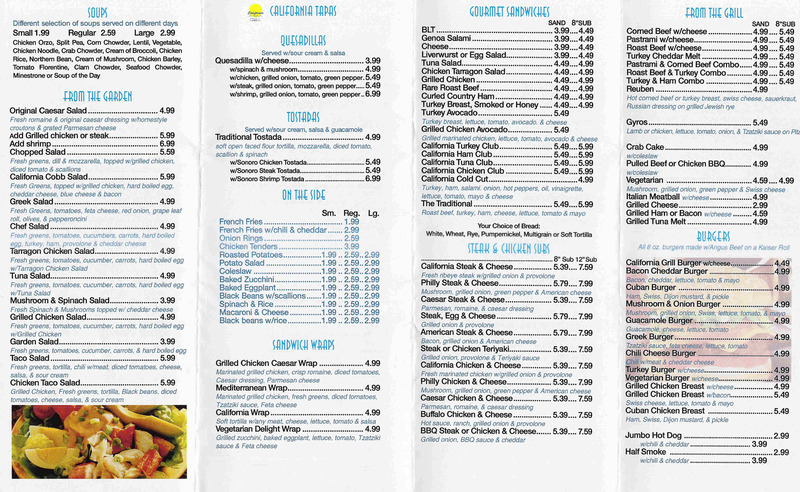 While they don’t have a menu available (just a big board when you walk in), they do offer a wide variety of options. One day, maybe I’ll feel adventurous enough to take a photo. Food: One of my favorite sandwiches is their chicken gyros ($6 includes tax) because the chicken is always moist, the pita bread is good, and they put enough feta to taste but not too much. The sandwich while it seems it might be “drippy,” it never is! And it’s really filling. Service: They’re polite and pretty quick. I can usually leave my office, get a sandwich and be back in my office in 15 minutes (or less). Atmosphere: With a couple of outdoor tables and chairs and only 5 or 6 stools, this is definitely more of a “grab-and-go” kind of place. Overall: As an alternative to some of the other places, I’ve started to add this my list of rotating lunch places. They offer frozen yogurt (hard yogurt, not soft serve) and ice cream; pizza pitas; gyros; burgers; deli sandwiches; etc. Their prices are very reasonable and good portions. I seem to always walk by places and never go in them and Skewers is another restaurant that I’ve wanted to try. Food:I ordered the Lamb Kebob Light Combination, but light it wasn’t! There’s a lot of food! I ordered a side of hummus which was a perfect smooth texture and fantastic flavor. The tabouleh was fresh with lots (but not too much) cilantro and tomatoes. The lamb had a little too much fat for my taste, but the good news was that it wasn’t dry and was yummy. On either end of the lamb skewer was a small piece of delicious eggplant. Next time, I’m going to have to order it because I bet it’s yummy. Service: I ordered to go so they were fine. Atmosphere: They have Belly Dancing Night on Saturdays. Overall: I thought they offered a lot of really good food for a good price. The interior is pretty casual so if you want to impress, this isn’t that place. Happy Hour: On Mondays, they offer half-priced bottles of wine. 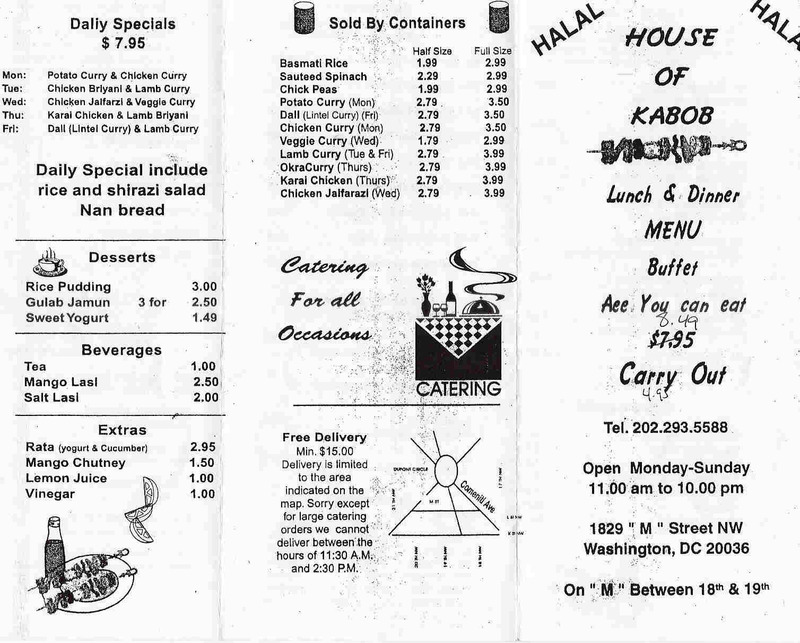 I’ve walked by House of Kebob a million (literally) times and only recently went in to try it out. Their menu can be found here and here. Food:I ordered a lamb shish kebob which was served on home-baked pita with lettuce, tomatoes, and peppers. The photo, if I may say so myself, makes it look amazing. In reality, there were only 4 medium chunks of overcooked lamb. It was dry and tough. But the redeeming quality in my mind was the vegetables — lightly cooked, they were fresh, crispy, and oh so good. There was a very thin yogurt sauce which too watery and dripped everywhere making a huge mess. The bread was really good, but towards the end, soggy. Service: It took them a couple of minutes to come out of the back kitchen, even though the door clearly shut. Once they did, they were polite. Atmosphere: There are about 6-8 tables and chairs and a bar with a few stools, but the restaurant is definitely small. The atmosphere is not one that will impress anyone and is a bit bleak. They also have a lot of pungent incense burning which was disappointing since to me, the best smell is that of food cooking in a kitchen. 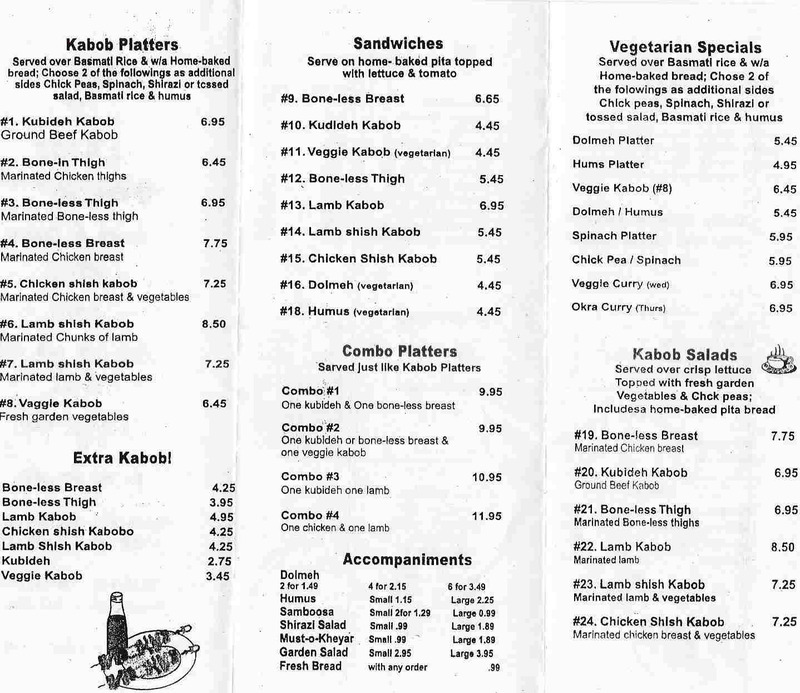 Overall:I’d skip the lamb and instead, perhaps try to the chicken or the veggie kebob. They also offer an all-you-can-eat buffet for $8.49 or carry-out buffet for $4.95/lb. And they deliver (minimum order must be $15), but not at lunch (bummer)! I was meeting a friend at Mourayo for dinner to catch up and try a new place. Both of us forgot the address (and I had left my cell phone at home), but I wish someone would have told me it was the restaurant with the big boat on their awning! Then I would have remembered! Anyway, after it ended up as one of Tom Sietsema’s fall 2007 restaurants, we both figured we had to try it! Food: My friend ordered one of the whole fresh fish grilled (I think it was the Royal Dorade) which was simple and good. I figured since she was getting the fish, I should get something different. So I ordered the “Pythagoras ‘Theorema'” which is the pork loin, figs, manouri cheese, and honey sauce. Wow, it was quite amazing! While it was sweet, it wasn’t overly sweet. The pork was cooked perfectly. Service: We sat at the bar since we didn’t make reservations — and it was packed on a Tuesday! Regardless, it was very pleasant. Plus, we were able to chat with an older gentleman (might be the manager/owner). He was such a nice guy and we enjoyed engaging in a discussion with him. We asked him what we should order, what wine to get, etc. Atmosphere: Very cozy and quaint. There’s only a few tables and seats so that’s why reservations are suggested! The attire is casual/business casual. Overall: I will definitely go back and I look forward to trying their many other tasty dishes!